Peter Mansbridge is the chief correspondent of CBC News. He anchors CBC's flagship nightly news program, The National, and all CBC News specials. He is also host of CBC News Network's Mansbridge: One on One. Mansbridge began his career in 1968 in Churchill, Man., where he helped develop CBC Radio's news service to Northern Canada. In 1971, he moved to Winnipeg as a reporter for CBC Radio, and in 1972, joined CBC Television. He became The National's reporter in Saskatchewan in 1975, and, in 1976, was named one of the program's parliamentary correspondents in Ottawa. He became chief correspondent and anchor of The National in 1988. In more than 40 years with CBC News, Mansbridge has provided comprehensive coverage of the most significant stories in Canada and around the world. He's interviewed countless international leaders. And he remains the only Canadian journalist to interview U.S. President Barack Obama and British Prime Minister David Cameron. During a decorated career, Mansbridge has received 12 Gemini Awards for excellence in broadcast journalism. He has also received nine honorary degrees from universities across the country, and he has also been recognized by leading universities in the United States and the United Kingdom. 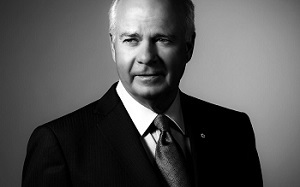 In 2008, Mansbridge was made an officer of the Order of Canada by Gov. Gen. Michaëlle Jean. In 2009, he was named Chancellor of Mount Allison University in New Brunswick. Peter Mansbridge was born in London, England in 1948 and now resides in Stratford, Ontario.